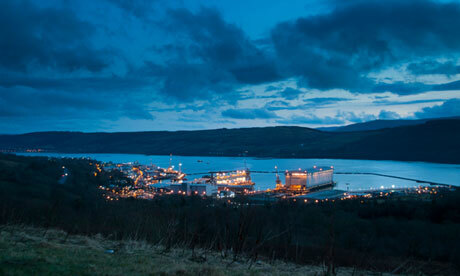 Faslane naval base in Scotland which hosts the UK’s nuclear submarines. A furious behind-the-scenes row has prompted Downing Street to disown a proposal to designate as sovereign UK territory the Scottish naval base that hosts Britain’s Trident nuclear deterrent, in the event of Scottish independence. No 10 rushed out a statement saying that it was neither “credible or sensible” to give the Faslane base the same status as the British sovereign military bases in Cyprus, following an argument involving senior members of the cabinet and the former chancellor Alistair Darling. Downing Street swung into action after Darling, who heads the pro-UK Better Together campaign, telephoned No 10 on Thursday morning to warn about the impact of a report in the Guardian about the Faslane base on Gare Loch in Argyll and Bute. The Guardian reported that Ministry of Defence officials were starting to examine plans to designate the Faslane base as a Sovereign Base Area along the lines of its military bases in Cyprus. The report dominated the morning lobby briefing in No 10, usually chaired by David Cameron, after the MoD confirmed the report in an email to the BBC late on Wednesday night. A decision was taken to try to kill the story after the unit in No 10, run by Andy Dunlop who co-ordinates the government’s handling of the independence referendum, issued a stern warning that the sovereign base idea was a gift to the SNP. Darling was understood to be particularly concerned because he feared that the MoD’s proposals for Faslane would undermine the central theme of a major lecture he gave at the University of Glasgow on Thursday on the referendum. The former chancellor he said he wanted Scots to make a positive choice to remain in the UK and “not merely to reject the risks and uncertainties of independence”. It is understood that a senior official from Darling’s Better Together campaign telephoned the No 10 Scottish referendum unit late on Wednesday night to express deep alarm about the Faslane plan. The group was assured that the No 10 unit was equally appalled that the private thinking of the MoD on such a sensitive matter had entered the public domain. Darling, who called No 10 himself, showed his irritation after his speech in Glasgow. Picking up on the submarine theme, he said: “It was a row that quickly surfaced and equally quickly it was sunk. It was a frankly ridiculous proposal to suggest we could possibly designate part of Scotland as different from the rest. I am glad the UK government has hit it hard on the head – that’s exactly what it deserved. This entry was posted in UK Submarines and tagged Faslane, SNP, Sovereignty, Trident on July 14, 2013 by jasonlockley.